John Wick penned a controversial article, “Chess is not an RPG,” purporting to define role-playing games, which is only slightly easier than rhyming with “orange,” if the blogosphere’s reaction is any indication. He says that having a working definition helps Game Masters focus on the right elements of play. Here I agree, though I think it’s really more important for game designers than GMs. Either way, to help GMs, Mr. Wick defines role-playing games as games “in which the players are rewarded for making choices that are consistent with the character’s motivations or further the plot of the story.” From this he concludes that the focus many games and players have on elements of balance is misplaced, since weapon tables, for instance, have little to do with character motivations or story and don’t advance those elements of the experience. On both counts, I respectfully disagree. OK, Mr. Wick, but wizard’s chess *must* be an RPG, right? That’s right, Risk actually does have you play a role. But it’s not a role-playing game, not any more than it is a gambling game, or an historical simulation game. Yes, you are in command of some kind of army, you do roll dice and draw cards to determine if you win or lose, and the figures and maps have an historical aesthetic, but none of those is Risk’s primary experience. The primary experience of Risk is making strategic decisions, specifically two strategic decisions: troop placement, and whether to press the attack or not. Risk is a strategy game not because it rewards strategy, though it does, but because you interact with the game through those strategic decisions far more than anything else. So now we need to step back and talk about game categories. The way we refer to “shooter games” and “strategy games” and “role-playing games” makes it seem like there is a criteria for each, and if a given game fulfills the criteria, then voila, it is inducted into the league of [category] games. But game categories are not that rigid, and games aren’t that easily categorized. 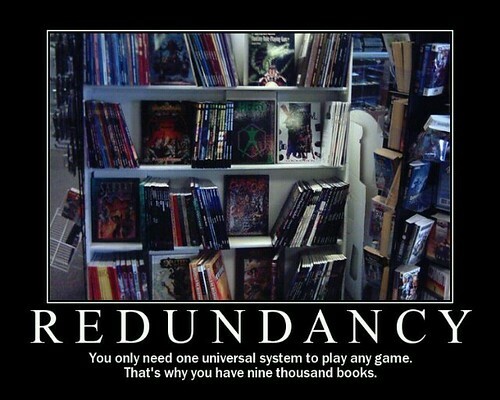 To form the League of Redundancy, yes. Instead of thinking about game categories as a circle, within which are the games that meet that category’s criteria, think of game categories like scientific elements. These elements are the distilled essence of that category, an abstract, pure, platonic ideal of a “strategy game,” or of a “first-person shooter.” Very few games are made of pure element, meaning very few games are made of pure strategic decisions with no visual motif, no vague hints of story, or no randomness, for example. Most games are alloys, combining several elements. But most games are interacted with through one or two of their elements. The rest are just there to give it flair or to make things work mechanically. Let’s look at Risk again. It is an alloy of several different elements, like the ones we listed above. But which element do you, as the player, engage with most directly? Is the primary experience of playing Risk imagining yourself as a 19th century general? If you wanted, could you even find out about recruitment, training, supply lines, espionage, technological advancements, domestic support for the war, and negotiating peace treaties? If nothing else, the bird’s-eye view of the world in relative real-time gives you just the first hint that you’re not really playing through the experience of a 19th-century general. So how do we know when a game is a role-playing game? The platonic ideal of role-playing games would have a 1:1 parity between the experiences of the player and the character. You see what your character sees, you feel what your character feels, you can attempt anything your character could do, and your understanding of the world is the same as your character’s. You also have the same incentives; what is good for your character is good for you as a player, and what is bad for your character is bad for you as a player. That is a distilled role-playing experience, where you perceive, know, feel, and act as the character does, where the inputs and outputs are the same whether from the player’s perspective or the character’s, where there is a synchronization between the player’s motives and the character’s. The more like that ideal a game’s experience is, the more of a role-playing game it is. A game is a role-playing game if its primary experience is close to that 1:1 synchronization between character and player. But enough high-falutin’ theory-talk, what does this mean to those of us who aren’t pseudo-academics writing blogs? Y’know, those of us who just play or run the game, maybe have a day job or two? I’ve berated you enough for now, but I’ll follow up in a day or two with more of a practical look at why this matters for designing or running an RPG. Plus I’ll talk about D&D, balance, and how one of my favorite table-top games, Marvel Heroic Roleplaying, might be less of a role-playing game than WoW. Yes, you read that right. Stay tuned. *I think this all stems from Mr. Wick’s concept of role-playing revolving around good characterization, since he points to games like Vampire or Pendragon which make you consider your character’s motivations as part of the rules. That does make for a game full of characterization, but I don’t believe that’s what role-playing means. **I want to point out that just because you’re closer to the role-playing element doesn’t mean you’re further from the strategic one. In fact, General: the Risking still relies on strategic decisions just as much as Risk does now, I’ve just added some role-playing elements. This entry was posted in Game Design, Games, TTRPGs and tagged game theory, gaming, genre, role-playing, RPG by Stubbazubba. Bookmark the permalink.